Speaking in New Zealand, he said it was important to develop machines which produced fewer emissions, while maintaining economic growth. 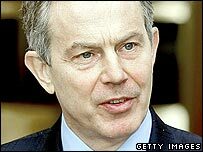 Mr Blair promised to push for an international framework to supersede the Kyoto Protocol when it expires. As part of the prime minister's marathon diplomatic mission, he is due to visit Indonesia on Wednesday. Downing Street said Mr Blair had identified 2006 as the year to get an international consensus on the goal of stabilising the Earth's temperature. In his speech in Auckland, the prime minister said the framework to replace Kyoto - which expires at the end of 2012 - must include China, India and the US. Solutions needed to be applicable to the developing world, he added. The BBC's political editor Nick Robinson said Mr Blair's move was "essentially pushing to one side all hopes that America would be chivvied or bullied to signing up to the Kyoto agreement". It was "pushing aside hopes that newly developed countries like China and India can be brought in, too", he said. The prime minister says a less ambitious agreement which "stabilises climate change, and stabilises greenhouse emissions" is a real priority this year, our correspondent said. A government report published on Tuesday said the UK was unlikely to meet its target of reducing carbon dioxide emissions by 20% by 2010. The Climate Change Programme review projects that new and existing policies would deliver a cut of 15 to18%. The government wants people to cut their personal emissions and is promising a stricter emissions cap for industry. The cost is too high and there are no incentives! It is also pledging £80m over next three years for microgeneration projects and tighter building regulations. Environment Secretary Margaret Beckett said the government was not giving up on the 20% goal, but said more had to be done to reach it. She added: "This programme contains a package of far-reaching measures that will affect all the major sectors and sources of UK emissions. "But it is not the last word. There is more that government can and will do to meet the target." Meanwhile, Downing Street has revealed the carbon dioxide emissions from the prime minister's plane will be "offset" by making an investment in "energy-saving technology" in the developing world. From April, all ministerial flights will follow suit, it was added. Friends of the Earth director Tony Juniper accused the government of failing to take the "tough action" on climate change. He said: "Once again the government has caved in to short-term political pressures and produced a totally inadequate response. "This pathetic strategy will not deliver the government's promise to cut carbon dioxide emissions by 20% by 2010, and will further undermine the prime minister's reputation on this issue." Shadow Environment Secretary Peter Ainsworth said the review was "a grim admission of failure", adding: "Worse still, it fails to chart a course which will get us back on track. "The government's efforts to tackle climate change remain piecemeal, timid and half-hearted." Liberal Democrat leader Sir Menzies Campbell said: "The review is nine months late and a failure. This is much bigger than a sidelined Labour manifesto pledge and a Whitehall turf-war. "The prime minister must call his ministers to account. He must explain to the nation how he will get Britain back on target to reduce climate change."